Blue Apron hit a record low of $US1.50 a share on Tuesday. The meal-kit maker announced it was launching a pilot program for on-demand delivery in New York City on the Grubhub and Seamless online and mobile platforms. Blue Apron shares are down 85% since their June 2017 initial public offering. 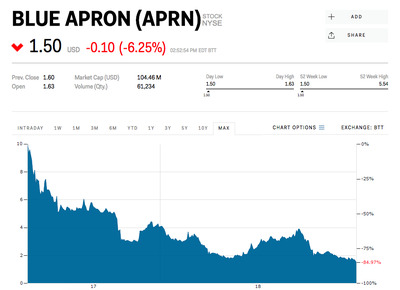 Blue Apron sank to its lowest level on record Tuesday after announcing its meal kits would be available for on-demand delivery in New York City. Shares sold off more than 6%, hitting a record low of $US1.50, after the meal-kit maker announced it was launching a pilot program for on-demand delivery in New York City on the Grubhub and Seamless online and mobile platforms. The program will offer customers “fresh, pre-portioned ingredients to easily cook two- or four-serving a la carte meals in 30 minutes or less,” and will allow them to add on specialty items. “This new on-demand product is a complement to our core offering, giving consumers – for the first time – the option to have a Blue Apron meal delivered to their doorstep in less than an hour,” Blue Apron CEO Brad Dickerson said in the press release. It has been a rough 15 months for Blue Apron. It was set to price its June 2017 initial public offering between $US15 and $US17 a share until Amazon announced it was entering the meal-kit business. That caused meal-kit maker to lower its IPO range to $US11-$US12 before ultimately pricing shares at $US10. Over the next several months, other competitors, like Walmart, would announce that they too were entering the meal-kit space. But increased competition isn’t the only problem Blue Apron has had to deal with. The company has struggled to keep customers coming back. In August, the meal-kit service said it saw a 24% year-over-year drop in customers during the second quarter as revenue per customer slipped to $US250 from $US251 last year. Blue Apron shares have lost 85% since their IPO.